There’s weather in So Cal. Hiking out of Idyllwild up Mount San Jacinto, I ran into a few snow banks, which made me glad. Then it started to snow lightly which made me laugh. It didn’t last long but the clouds spoiled the view. Woke up to a frozen water bottle and began the tortuous descent to Cabazon. A long day, 18 miles of downhill in high winds, followed by 5 miles of slogging through deep sand in a head wind. No place to camp by the I-10 but I finally stumbled in to Ziggy and the Bear’s trail angel operation at 6:45 pm, where 14 or 16 fellow hikers were stretched out side by side in sleeping bags in the backyard surrounded by wind breaking fence. Sanctuary! The winds continued the next day along the crest, blowing me off my feet a number of times until I dropped down into Mission Creek and camped in perfect solitude while light rain freshened the air and packed the sandy trail for the next day’s beautiful uphill 22 miles back into the wind. A wicked howling night with a wind chill that made me feel like I was home, followed by a 20 mile day to Big Bear, which was markedly improved by friends Jim, Larry, Tom and Ellen who met me with cold IPAs 4 miles from the parking lot. How cool is that? Beer killed the residual leg pain from the long downhill day, but it’s rather fortunate I had trusty hiking sticks to keep me from tipping off the trail. The day before Day 1 at Scout and Frodo’s in San Diego. 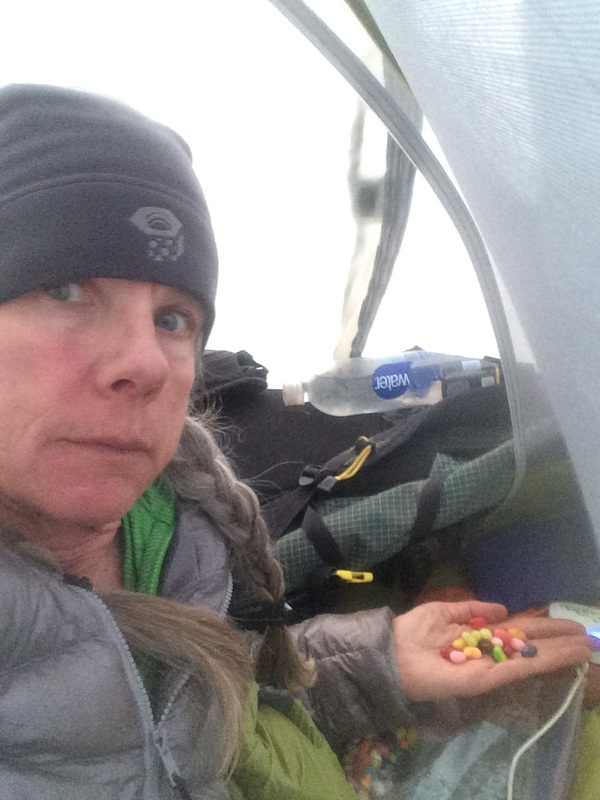 I stayed in a tent with 4 other women and started the trail the next day with them (plus 6 other thru-hikers), including Poppy (Natasha). We somehow found ourselves hiking similar miles and camping and town visiting on about the same schedule. We arrived at Big Besr and stayed at the hostel. The next morning she awoke to a foot infection, very sudden, and has left the trail. I will miss her strong, cheerful, and self reliant presence. Heal well! Back on the trail at 266, I stealth camped just 14 miles in due to the start necessitated by getting a ride. Then a big 25 because there were no flat spots to put a tent in the beautiful Deep Creek canyon. Glorious day, I saw a coral snake and a black and white striped snake, kind of had to hustle them off the trail. And frogs! Every day I’m out here is a gift. I’m even more aware of that since seeing how suddenly my fellow hikers can be sidelined. In Big Bear alone, Snack Pack left with a pinched nerve in his shoulder, Poppy got an infection, a girl was made miserable by her hiking partner and I heard sweet Bree rolled her ankle badly. So far I’ve worked through most of the usual aches and pains I expected from the simple act of walking while carrying a backpack day after day. I am happy. how many marathons do you figure you will do…….with a backpack no less. ( -; thanks for the update. 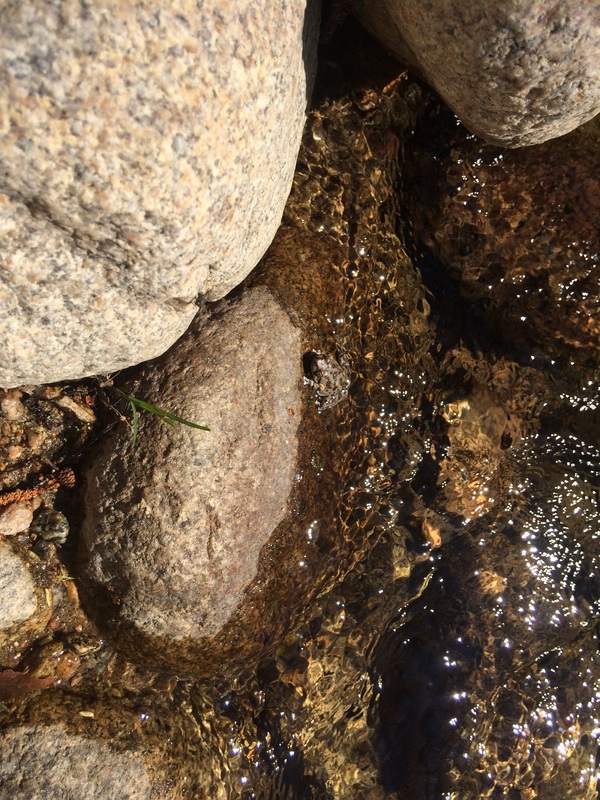 Sounds like the high points – trail angels, friends bearing IPAs, snakes(?) 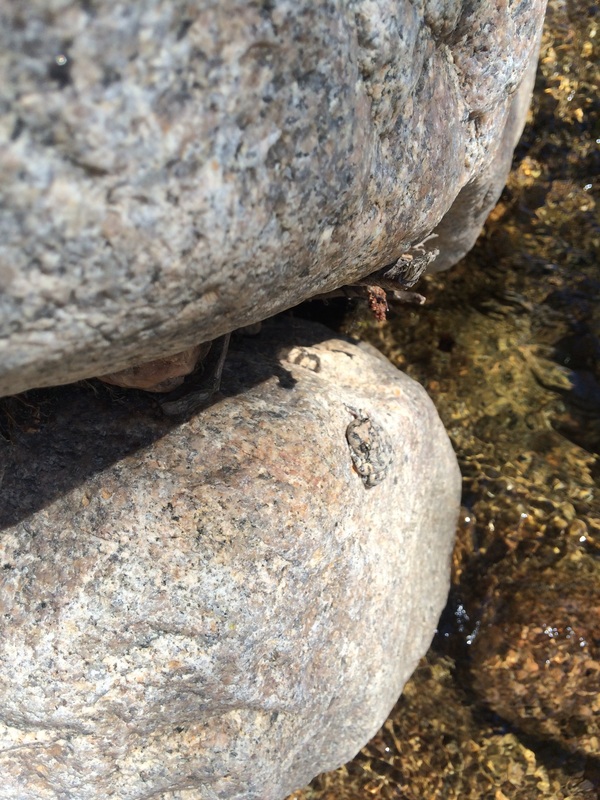 and desert frogs, glorious solitude – make up for the weather struggles and the toll on trail companions. I especially liked your last 3 words. I stalk you daily using your InReach. Just thought you should know. Glad to hear that you are making good progress and not suffering any significant setbacks. Stay happy.